Several golf course ponds and lakes around the world have difficulty retaining water. 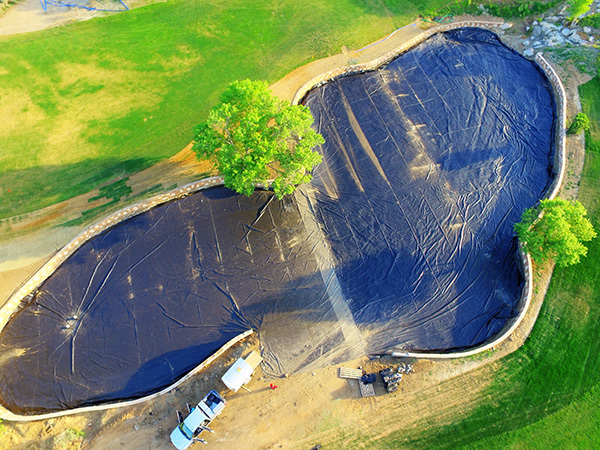 Usually the most affordable option is to line the golf course pond with a high quality geomembrane liner. As experts in all types of pond liners, Western Environmental Liner offers a wide array of liner options to solve any water loss problem with warranties up to 20 years. There are generally two distinct different types of golf course ponds. Decorative golf course ponds. With decorative golf course ponds, one of the primary functions is for the pond to look beautiful. Although these ponds at times can be used for irrigation of the surrounding grass and trees, the beauty of these ponds is one of the main reasons a golfer may choose one golf course over another. Western Environmental Liner has several techniques to ensure that the golf course pond liner looks beautiful in these decorative ponds. Our 45 mil Reinforced Polypropylene Liner comes in a light tan color that blends in well with the environment, and is a liner many golf course general managers choose. We also have ways to ensure the liner is not seen if necessary to give the decorative pond a very natural look. Decorative ponds are often designed in unique shapes. We can customize our liners to these shapes and can do installation of the golf course liners to provide a more precise fit than would otherwise be possible. Irrigation ponds. These ponds are often only used for irrigation and are usually in an area not accessible or seen by golfers or pedestrians. The primary usage of these ponds is to ensure the surrounding vegetation is well watered in an efficient manner. Since these ponds are not normally aesthetic in nature, very affordable options are available such as our Aqua Series line. Most irrigation golf course pond liners can be made in one piece for easy installation. Whether your golf course pond liner is for decorative or practical use, please contact Western Environmental Liner for your Golf course liner needs and we will be sure to help you choose the best value for your particular application.